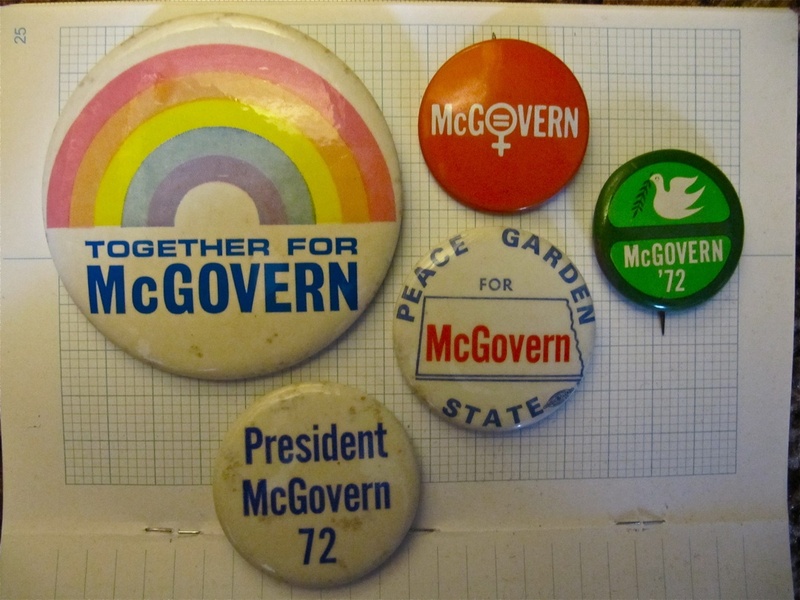 George McGovern buttons from a private collection. Photo taken on October 21, 2012. 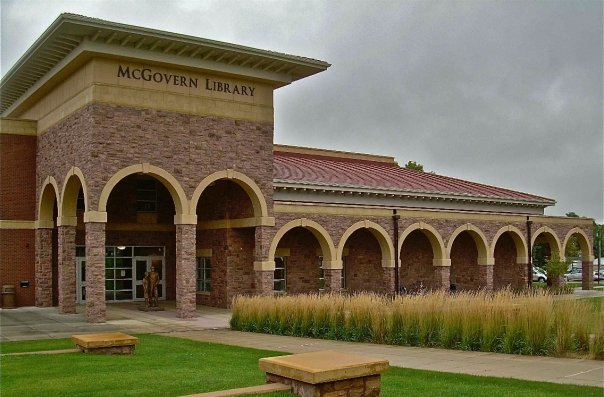 The McGovern Library at Dakota Wesleyan University in Mitchell, South Dakota. McGovern lectured history at this campus. that signifies equality, the dove (certainly a sign of peace and love), and the geopolitical outline of North Dakota that emphasizes the state’s Peace Garden slogan. These photos came from the private collection of Molly McLain. No doubt there are more of these buttons tucked away in the attics, storage lockers and basements of a variety of homes across the country. Another photo is of the McGovern Library at Dakota Wesleyan University. If I remember correctly, the building (not the McGovern Library) where McGovern lectured history at DWU still stands. To a large degree these buildings help connect our discombobulated present with the past, providing a kind of stability that is both real and imagined. McGovern lectured history in Mitchell, and he was from Avon, South Dakota. If looking at McGovern, it seems that you can do anything in this country if you put your heart and mind to it. It just so happened that McGovern also had a genuine soul (not every politician or individual has this). Here’s to George McGovern, and his well played life. …well played indeed. 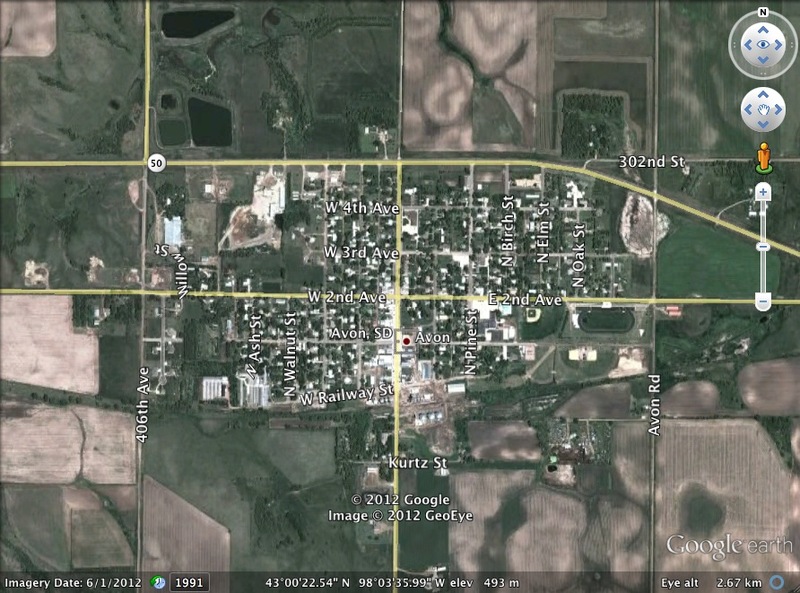 A Google Earth image of Avon, South Dakota, the home town of George McGovern. This entry was posted on Sunday, October 21st, 2012 at 11:42 am	and tagged with Archaeology, George McGovern, South Dakota and posted in Uncategorized. You can follow any responses to this entry through the RSS 2.0 feed.